Ever looked at a recipe and wondered how to cook cauliflower rice? Here are 4 simple, delicious and healthy ways to cook it! Have you ever wondered how to cook cauliflower rice? Well, considering I get this question A LOT, I am guessing that you HAVE asked this. I share MANY cauliflower rice recipes with you, and SO many people ask if there were other ways to pre-cook their cauliflower, WITHOUT using the microwave. I get it. Personally, I don’t mind using the microwave every so often but I know that some of you DO NOT. 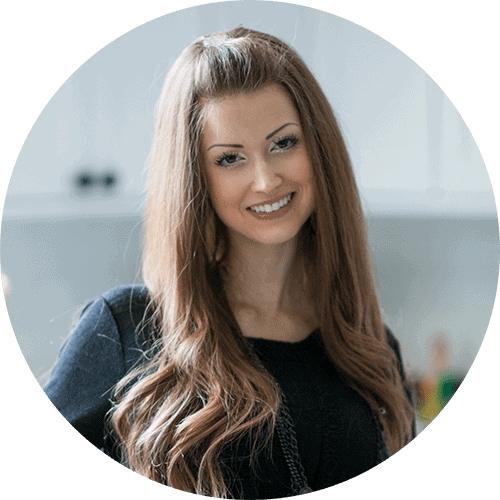 I always want to make FFF super helpful for ya, so I figured I’d test out a few cooking methods and share them with YOU. I’ve tested out 4 different ways, and shared my findings below. But first, what IS cauliflower rice? Cauliflower rice is when you take a head of cauliflower, chop it up into bite-sized florets, and then pulse it in a food processor until it breaks down and looks like the texture of rice. It’s a great sub for rice if you’re looking to watch your carbs or calories or in recipe such as cauliflower tater tots, cauliflower pizza or cauliflower fried rice. 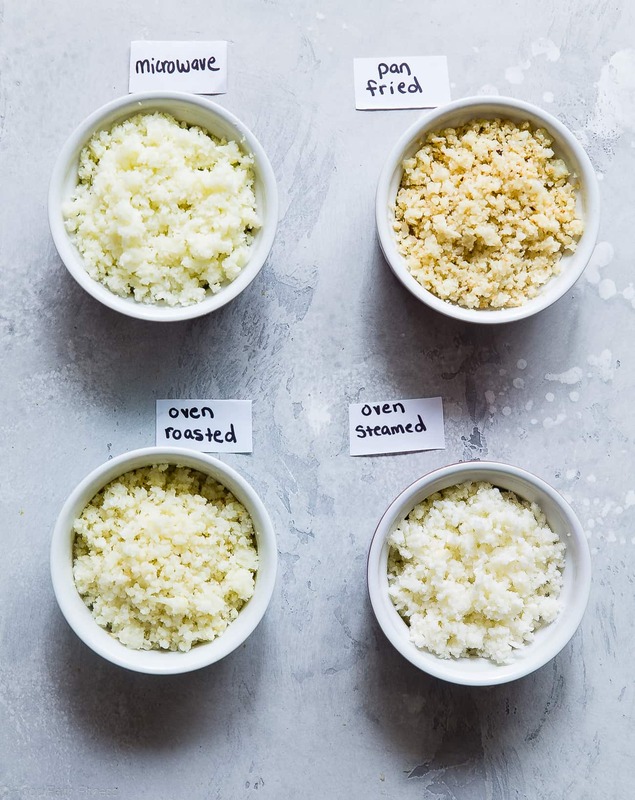 There are 4 ways to cook cauliflower rice that I LOVE. 1. In the microwave: This is the way that I typically cook riced cauliflower for recipes that use the cauliflower rice IN IT, not as a side dish. I love it because it’s the fastest way to cook it. However, I don’t like this method if I am going to be eating the cauliflower rice alone, as a side-dish, as it lacks flavor. This is the best way to cook cauliflower rice when you are going to use it make recipes like the ones mentioned, or some paleo cauliflower tater tots. Simply rice it in the food processor, put it in a microwave-safe bowl, cover it, and microwave for about 5 minutes, depending on how much you have. If it’s a HUGE bowl, stir it after 5 minutes and then microwave an additional 5 minutes or so, until it’s tender. 2. Steamed in the oven: Cooking cauliflower rice this way, produced the exact same results as the above way, just without using the microwave. 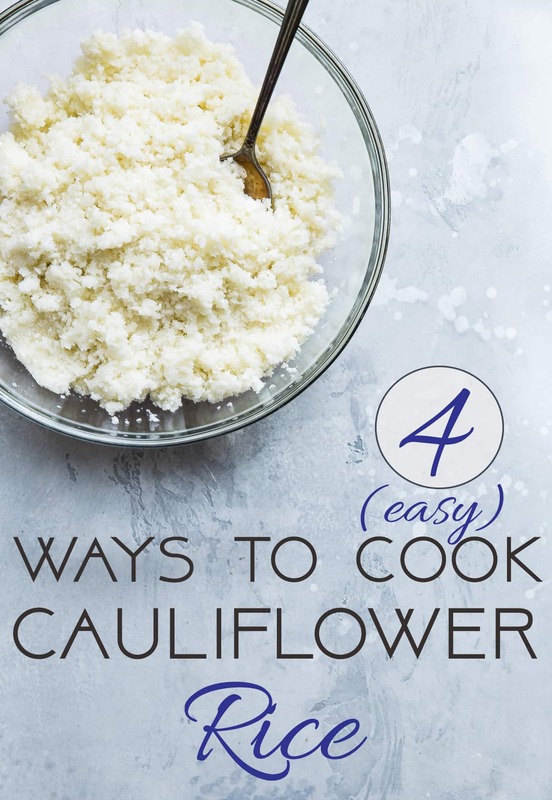 The process is very similar in the sense that you rice the cauliflower in a food processor and then place it in an oven-proof dish with a lid. Cover it and bake at 400 degrees for about 10-15 minutes, again depending how much you have. The goal is for the cauliflower rice to be nice and tender! 3. Roasted in the oven: Cooking riced cauliflower this way gives it more flavor and a little bit of crispy texture. If a recipe calls for steamed cauliflower, I would NOT use this method, as it is not the same texture. However, this is a good method for things like side dishes, or cauliflower rice salads. Simply rice the cauliflower and toss it with a drizzle of avocado or olive oil. Spread it in a single layer on a baking sheet and bake at 425 degrees for 10-15 minutes, stirring once if you have a large batch. The cauliflower rice is done when it’s slightly golden brown and crisp. 4. Pan-Fried: This is my FAVORITE way to cook riced cauliflower if I am eating it alone, as a side dish. Frying it in some oil gives it a ton of taste and crispy, golden-brown texture that makes it super delicious. However, I would say it’s the furthest texture away from actual rice – but, again, it’s the tastiest. Rice in your cauliflower in a food processor. Heat some olive oil or avocado oil in a large skillet on medium heat. Once hot, add in the cauliflower rice and cook, stirring occasionally, until the rice is golden brown and crispy, about 5-10 minutes. The key is to use a large pan and have the cauliflower rice really spread out over it, not all crowded together. This makes it nice and crispy! I hope this helps and that you’re now on your way to rockin’ the world of riced cauliflower! I usually just end up steaming/frying it a bit when I add it to dishes on the stove! I’m saving this for when I jump back on the W30 bandwagon after this kiddo’s big debut! We love cauli in our house! I used to have a bad habit of using the microwave religiously. Now, I totally love using the oven and the stovetop for everything! Pan-frying and steaming cauliflower rice are probably my favorite ways to cook cauliflower rice too–I have to try roasting! Roasting is SO GOOD girl! you totally need to try!